Using state-of-the-art electronics, the WL550 Oil Water Interface Meters deliver reliable, rock solid performance in the field. This allows more readings and more accurate measurements compared to other similar oil water interface meters. The oil water interface probes use infra-red refraction to detect hydrocarbons and conductivity to detect water. The oil water interface meter's triple-sealed probes do not need to be accessed by the user. Using "smart electronics" the oil water interface probes will ignore any damage to the optical lens and continue to perform. Similar to a water level meter, the WL 550 Oil Water Interface Meters produce a solid tone in water and an intermittent light and tone indicates the presence of hydrocarbons. This system doubles the oil water interface meter's battery life and provides better overall performance. The standard oil water interface probes are 5/8 inch (16 mm) in diameter; however a unique 7/16 inch (11 mm) probe for ½ inch (12.7 mm) ID wells is available. Impact proof oil water interface probes resist all solvents found in environmental monitoring. The oil water interface meter's probes are far more chemically resistant than probes using polyurethane or polysulfone optics. Stainless steel shrouds protect and secure the oil water interface probes while being more durable than plastic shrouds. The oil water interface meter's optical sensor and electronics work together to ignore minor or severe scratches. Setting a new industry standard the WL550 oil water interface probes will detect a 0.02 inch (½ mm) layer of hydrocarbons versus the typical 0.12 inch (3 mm) hydrocarbon detection limit. The oil water interface meters can be recalibrated to 0.04 inch (1 mm), 0.08 inch (2 mm) or 0.12 inch (3 mm) hydrocarbon detection limits for user preference. The water sensitivity can be increased on the oil water interface meters to ensure quick readings or reduced to avoid bridging when the water contains a lot of dissolved solids, giving the user ideal performance in all field conditions. The WL550, Oil Water Interface Meters, have a rugged alumnium bearing. Unlike many of the low cost plastic reels on the market which use frames too small for enough ground clearance when winding and rarely use a detachable module for cleaning the WL550 Oil Water Interface Meters are designed specifically for environmental monitoring and rugged field use. The oil water interface meters have lightweight aluminum faceplates with solid metal and machined nylon components that will not crack under tough field use. There are no thin-walled molded components on the oil water interface meters to fracture or break. The oil water interface meter's easy to use ergonomic frame and hub size are ideal for winding tapes under rough field conditions. A threaded stainless steel axle prevents welds from cracking and resists corrosion keeping the oil water interface meter's reel running smoothly. Double sealed ball bearings are added for oil water interface meters with longer lengths. The oil water interface meter's electronics module is removable for easy decontamination. Designed specifically for measuring hydrocarbons and organic solvents the oil water interface meter tapes are four times more accurate than common flat white TV cable-type tapes. Oil water interface meter tapes use the highest accuracy yellow measuring tapes available (0.008% or better guaranteed). All oil water interface meter tapes meet or exceed federal specification US GGG-T-106E(U.S.A) or EEC CLASS ll (Europe). The tape zero point and probe zero point coincide exactly to within 0.01 inches (0.254 mm) versus 0.06 inches (1.52 mm) found on most industry standard oil water interface meters. Common flat white tapes use twisted stainless steel wires that can untwist and lengthen up to 1/2 inch (13 mm) per 100 ft (30.5 m) from the oil water interface meter cable's own weight. 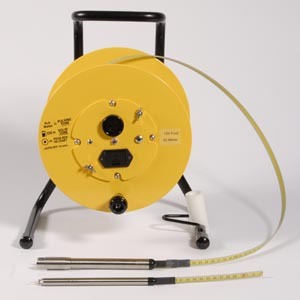 The unique flat spring steel measuring tape of the WL550 Oil Water Interface Meter has a breaking strength of 297 pounds (135 kg) allowing it to hang straighter than standard tapes and not stretch (less than 0.001 inches (0.025 mm) under a 35 pound (16 kg) load. A clear Kynar jacket covers the oil water interface meter's conductors protecting the graduations and numerical markings. The oil water interface meter's Kynar covering is about 4-5 times harder (Rockwell hardness) than softer polyethylene white tapes making it less likely to be cut or damaged. The WL550 Oil Water Interface Meter tapes are chemically resistant to all chemicals found in environmental monitoring and will not become softer when exposed to gasoline and other solvents. The covering also makes it easier to decontaminate Global Water's oil water interface meters than meters with embossed tapes.